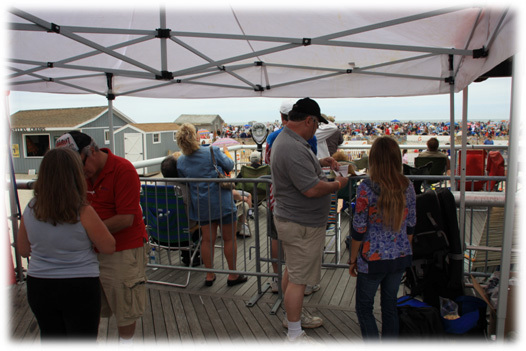 May 2012: Skin Cancer Screenings were provided at the Long Island Air Show held at Jones Beach, Memorial Day Weekend. What better way to start your summer than with a Skin Cancer Check up, and information on how to protect yourself from the dangerous rays of the sun. CCMAC thanks Bethpage Federal Credit Union, sponsor of the Jones Beach Air Show for inviting us to educate and screen attendees during this Memorial Day Weekend Event. We are grateful for the services of Dr. Steve McClain who never says no, and Dr. Ted Daly who conducted skin cancer screenings during this event. Pictured below are Dr. Steve McLain of McLain Laboratories, and Dr. Dennis Daley of Garden City, examining attendees at the air show.